Lily Jackson Hair & Make Up. Follow the link to our online booking system. 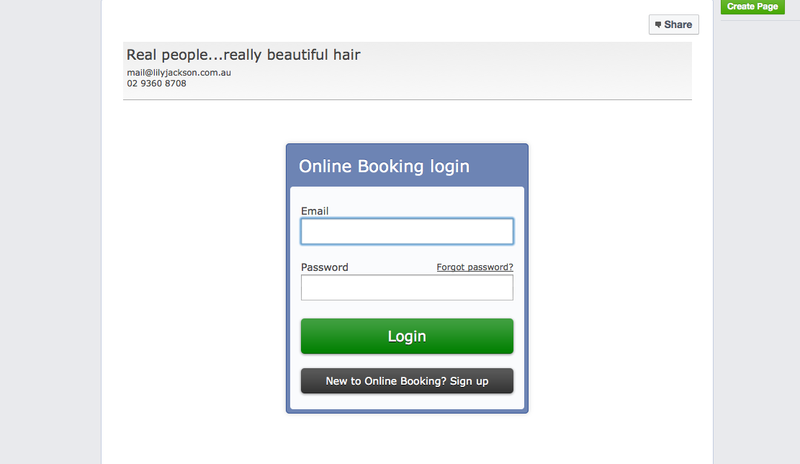 Lily Jackson Hair & Makeup online booking login screen. Select ‘new to online booking sign up’ button. 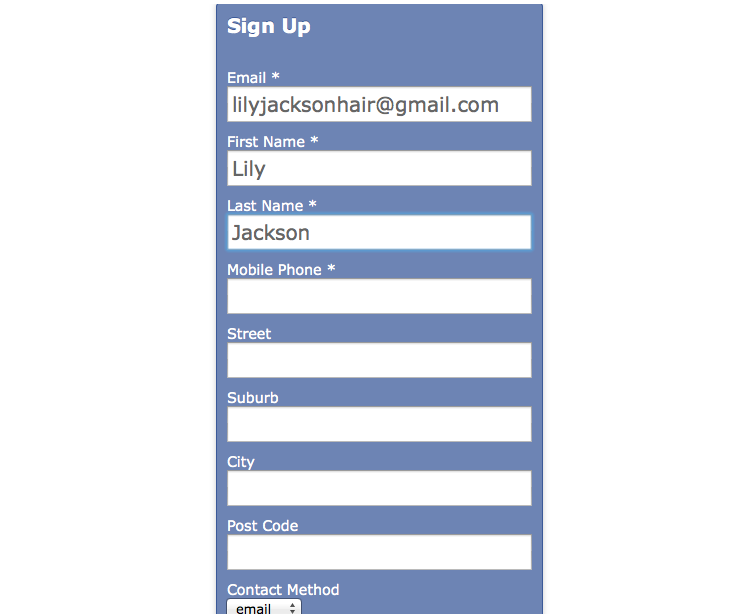 Lily Jackson Hair & Makeup online booking email submit screen. Fill in Sign Up Details form. 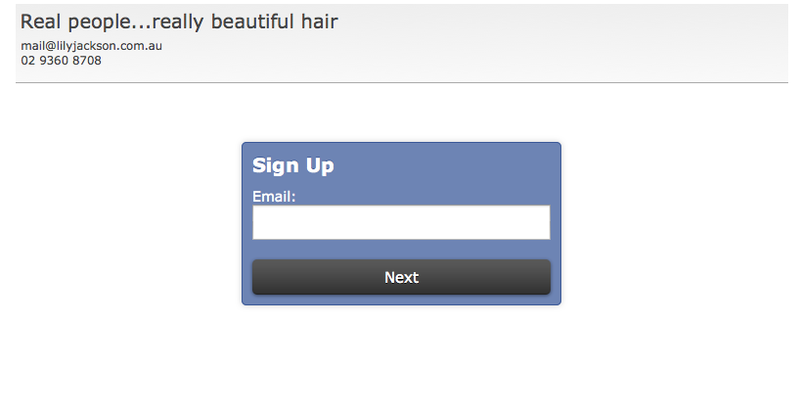 Lily Jackson Hair & Makeup online booking sign up screen. 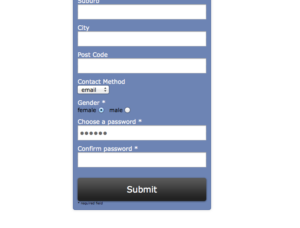 Lily Jackson Hair & Makeup online booking process instruction the user to check their emails. Email containing activation link required to sign up to the Lily Jackson Hair & Makeup online booking facility. You will be redirected to ‘make a new booking’. 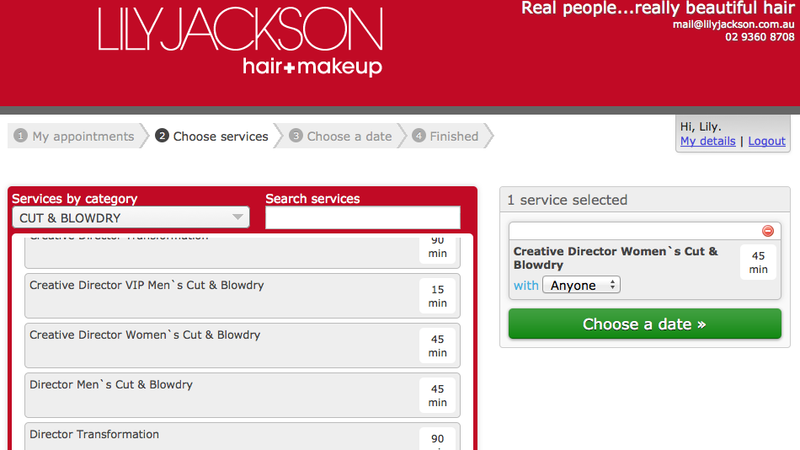 Screen shot of Lily Jackson Hair & Makeup online booking facility showing the user is logged in, the home screen for appointments displaying they have no current or past appointments. If you are an existing client you will be able to see a list of the services you usually have when you come into the salon. Choose the services you would like to have. Screen shot of the second step of the Lily Jackson Hair & Makeup online booking process where the client selects the services they are seeking to make an appointment for. You can select service categories in the drop down menu. This will make selecting your services easier and quicker. More detail of the second step of the Lily Jackson Hair & Makeup online booking process where the client selects the services they are seeking to make an appointment for. The services will be generated on the right hand side of the page for you to see. 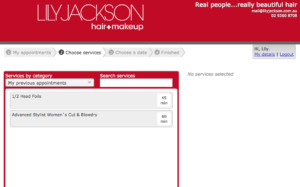 Lily Jackson Hair & Makeup online booking process showing that when services are selected they appear in a panel on the right hand side of the screen. 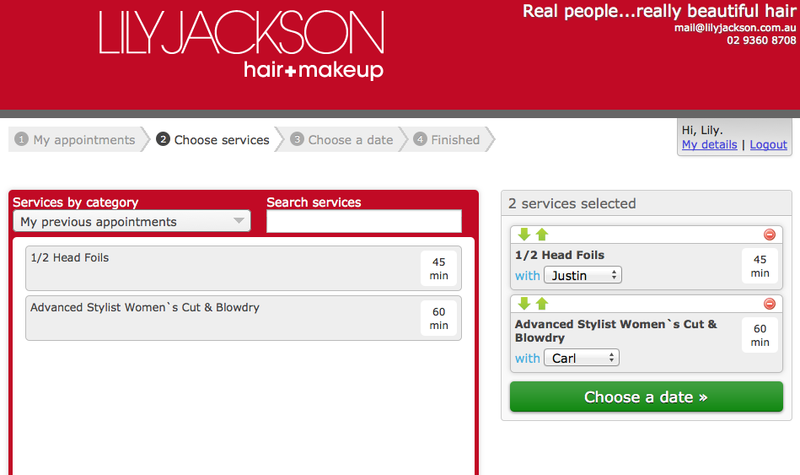 You can choose a particular Stylist for each service on the right-hand side column once you have chosen your services. 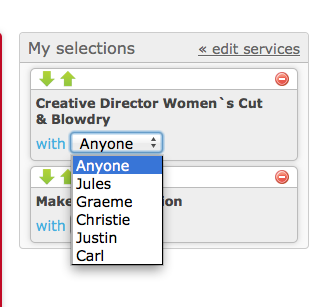 Or you can leave this field as ‘anyone’ if you don’t mind or are not sure of which Stylist to select. 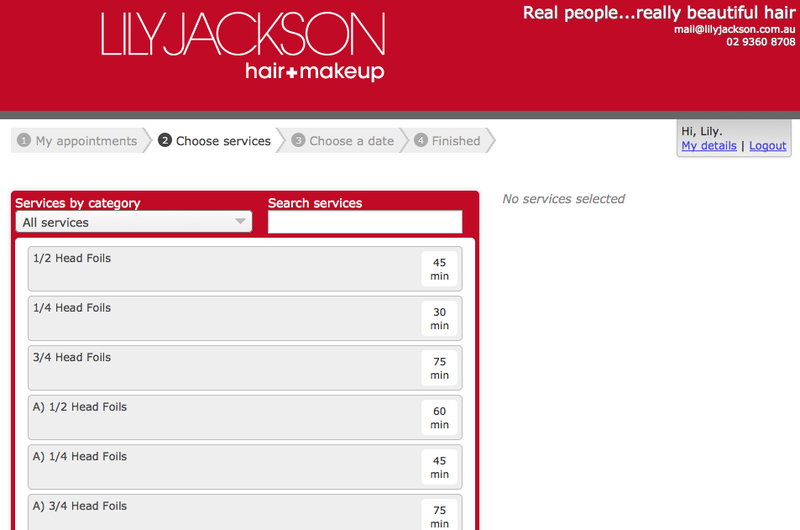 Lily Jackson Hair & Makeup online booking process showing more detail when services are selected they appear in a panel on the right hand side of the screen. You will then have options to choose which day you would like for your booking. The tabs at the top of the page allow you to jump either 1 day or 1 week at a time. Select the day you want. De-select any time that isn’t suitable. Lily Jackson Hair & Makeup online booking showing all the available appointment slots for the services and stylists selected on the date selected. Select the appropriate time by clicking on the ‘book it’ button. A pop up box will appear showing you the day, time and services you have selected. You can add in any details you want to share with us in the ‘notes’ box here. 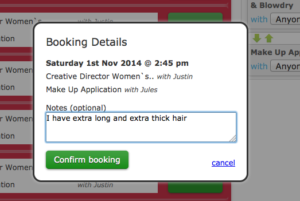 Lily Jackson Hair & Makeup online booking showing how a client can add a note to their appointment time like “I have extra long and thick hair”. You can also cancel and regenerate your booking by clicking on ‘cancel’ in this box if you’ve made any error. A pop-up box will let you know ‘booking sent! thank you’. Lily Jackson Hair & Makeup online booking process showing that the booking has been sent and advising that a confirmation email will be sent once the booking is confirmed. 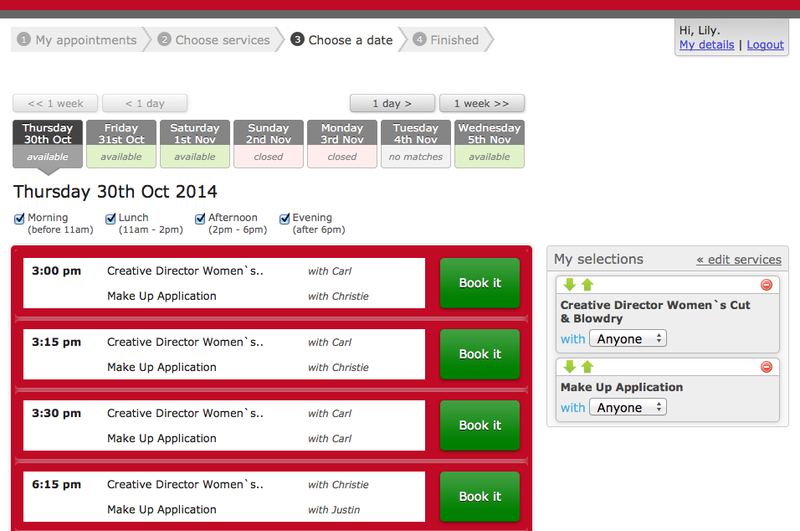 Lily Jackson Hair & Makeup online booking showing how confirmed appointments appear on the home screen. Keep an eye out in your email inbox as you will receive an email to edit, confirm or deny your booking request. Lily Jackson Hair & Make Up online booking process showing the tentative booking email clients receive after finishing the online booking process. 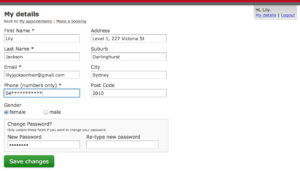 You can change and update your online details in the ‘my details’ tab on the top right of the booking screen. 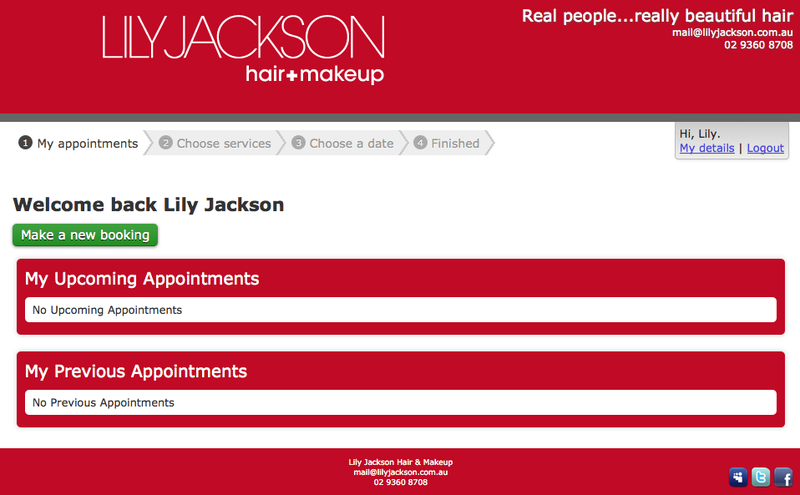 Lily Jackson Hair & Make Up online booking process updating of your client details. You can now ‘logout’ of your online booking account. We will be in touch with you to finalise your booking over the phone. NEW CLIENTS please note we request payment of a 50% deposit over the phone on a credit card to secure you first appointment with us.